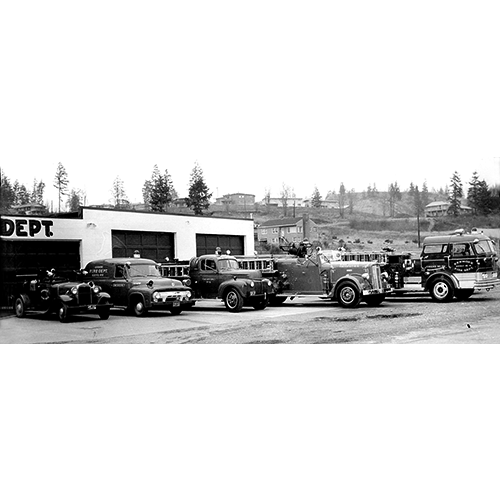 The Kenmore Fire Department displays a variety of equipment in the late 1950s at its first station, located at 67th Avenue NE and NE 181st Street. The vehicles are (left to right) the "whoopee wagon," a 1954 Ford panel truck remodeled as an aid unit, a 1944 Mercury ladder truck, a 1949 Ward LaFrance ladder truck, and the department's newest vehicle, a 1955 Mac pumper truck. Photo courtesy of Kenmore Fire Department.